India has high incidence of calculus especially in Gujarat, Rajasthan, Punjab and Madhya Pradesh. Different types occur with different frequencies in different parts of the world probably as a consequence of dietary and environmental factors but genetic factor may also make a significant contribution. · Uric Acid and other metabolites of purine metabolism. Majority of stones are admixture of two or more of the above components. Urinary tract stone formation is a multi factorial complex process dependent on loss of physical chemistry which governs crystallization of sparingly soluble salts in aqueous solution. The process of precipitation leading to crystallization of any mineral stone constituents in urine super saturation in urine. Normal urine has several inorganic as well as macromolecular inhibitors of crystal formation. The kidney’s important function is to conserve the water and also excrete minerals which have low solubility. Thus a delicate balance exists between crystal formation and its inhibitors. Whenever this delicate balance is disturbed in favor of crystallization condition exists for stone formation. These are irregular in shape, usually single. It’s covered with sharp projection which tends to cause bleeding. The surface of calculus is discolored by blood. 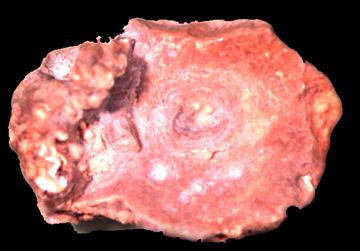 A calcium oxalate monohydrate stone is hard and radio dense commonly known as MULBERY STONES. These are hard, smooth and often multiple. The colours vary from yellow to dark brown and are typically faceted. These are radiolucent common in men. 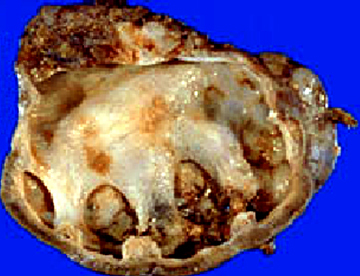 Half of the patients with uric acid stones have gout. 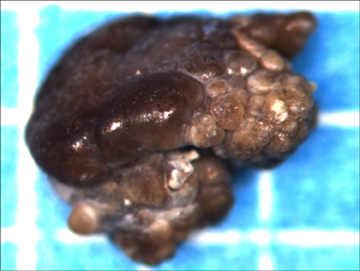 These are uncommon; appear in urinary tract of the patients with a congenital error of metabolism that leads to cystinuria. 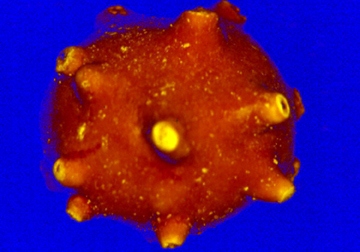 These are radiopaque often multiple, hexagonal. 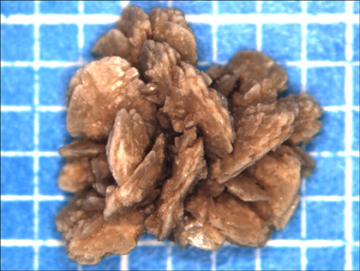 White crystals of cystine appear only in acid urine. These are extremely rare. They are smooth and round, brick red in colour and show lamellation on cross-section.